Kensington Publishing Corporation, 9780758235107, 426pp. In an extraordinary debut novel, Bass weaves a quirky, heartbreaking story about sisterhood, family, friendship, and loss, played out against the backdrop of a singular Texas farm. 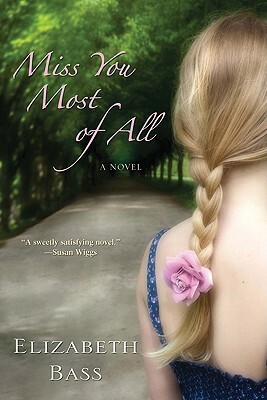 Miss You Most Of All is told from the points of view of four different characters: Rue, Laura, Heidi, and Erica. Do you feel the story belongs to one of them more than the others? Was there one character in particular who you sympathized with? How long would have lasted at the Sassy Spinster Farm? Would you have stuck it out there the full two weeks or demanded a refund the second day? Sisterhood is central to the story, even between characters that aren't related, such as Maggie and Erica. What are the different sisterly dynamics between the many characters? Which seem most like the relationships you have experienced? At one point, Laura decides she never felt any rivalry towards Rue because envying her would have been laughable, like envying the person you were adrift with on a lifeboat. Do Laura's thoughts in this instance ring true to you? Do you think they seem true to Laura because she and Rue grew up in a rural area, or are most siblings in a lifeboat in one way or another? What did you think of the relationship between Webb and Laura? Was Laura correct to discourage Webb for so long? Early in the story, one character says Laura is a bad influence on Erica. Is she? Are there instances in the story when she tries to take a mentoring role with Erica? Movies are discussed often, and sometimes heatedly, among the characters. Do you believe that common taste in films (or books or music) provides a strong bond between people? Can differing taste cause rifts in relationships? Have you ever been in the position Laura often finds herself in, of being the only person in the room who dislikes a movie everyone else loves? How would you handle that situation? The car accident Rue and Laura had when they were teenagers is thought of often but rarely discussed. Whose life was most changed by the accident? Laura thinks that Rue must have to start every day forgiving her. Do you think this is true? How large a part has guilt played in forming Laura's character? What role does Heidi play in the story? Does she disrupt the relationship between Laura and Rue? How would the summer have been different without her? Laura prides herself in being tough and abrasive, while Heidi openly admits to having many weaknesses. Are they reliable judges of their own characters? Are there points in the story where Laura actually seems more insecure or over-sensitive than Heidi? The two most prominent male characters, William and Webb, are very different. William is spoken of in negative terms throughout, while Webb is universally adored. Were there things about Webb you disliked? Did you ever feel sympathy toward William? How does her illness affect Rue? Were there moments when you felt you would have acted differently if you had been in her shoes? During Rue's cancer treatment, she grows closer to Heidi while she often seems to hold Laura and Erica at arms length. Why? Have there been stressful moments in your life when you were drawn to the companionship of some a certain friend or family member over others? The principle setting of Miss You Most Of All is a farm that welcomes guests. In your opinion, what is the appeal of agritourism? Do you think it would attract women more than men? Is there one character in the book that seems to have more optimism than the others? Who? Are Heidi and Laura friends at the end of the story? Did you expect them to be?